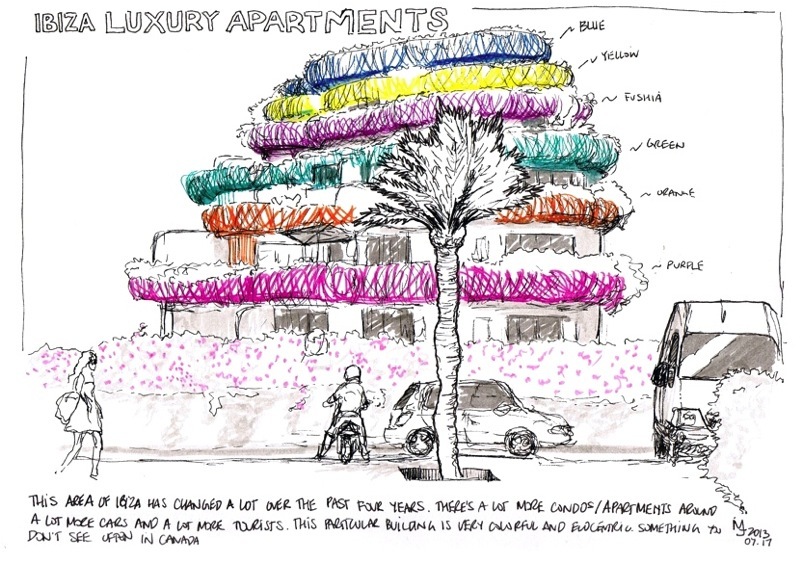 I had an opportunity to return to Ibiza while in Spain after the symposium and I took some time to do a little urban sketching. 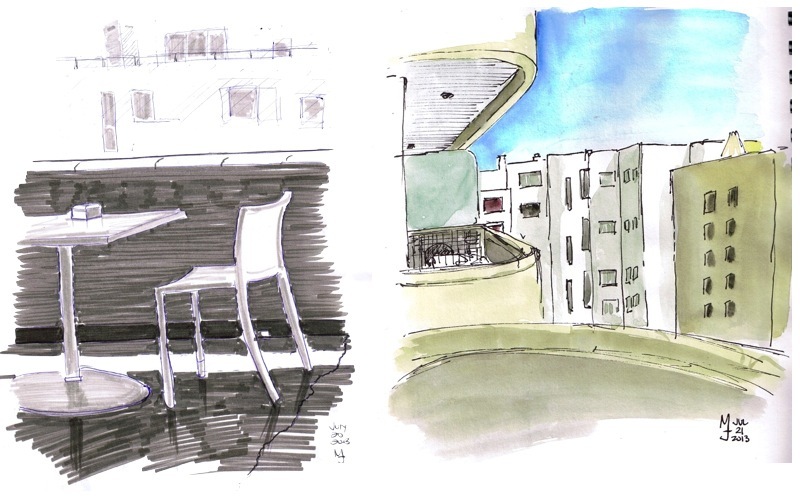 I did a couple sketches from our hotel room at El Pacha. Above, on the left, is the view from the room of our balcony. Four year ago, we were still able to see a bit of the ocean from the rooms while they were starting to build the apartments in front, but not anymore. It's interesting to see how this city has grown over a short period of time. It was a little sad to see that most of the units looked empty from our side, especially during high season. There's beautiful inside. The project is called Patio Blanco. Still above, on the right side, is another view from our balcony. You can see the neighbour's balcony with a glass panel as the divider and the heat pump below it. There were not a lot of people on the balconies while we were there. I think one of the reasons might be related to a design issue: The heat pump throws hot humid air directly into the balcony where people would sit, which makes it rather uncomfortable to stay for a long period of time in the summer. Mind you, it's very practical if you want to quickly dry some clothes. 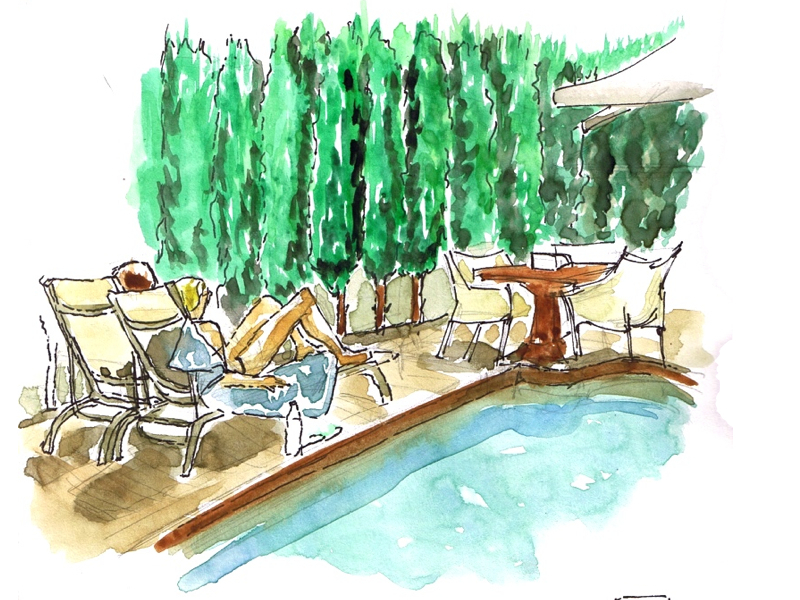 The hotel has a nice little enclosed pool area and I came back twice to do a little sketching and practice watercolors. I'm starting to like the many possibilities of watercolors. You can create any color you like very easily. Walking around the neighbourhood, we discovered more "new" apartment buildings. This one was particularly interesting because of its colors. Each level had a different color. Called Las Boas it was designed by world renowned architect Jean Novel in collaboration with architect Joseph Ribas. I like that it had plants all around the balconies as well. It's a great mix of modern and organic architectural features. 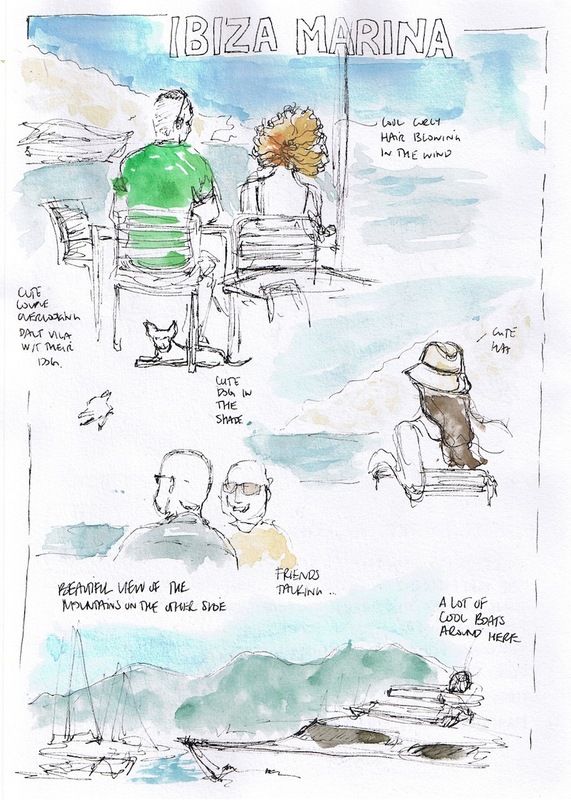 We sat at one of the restaurants in the marina for a little snack and I didn't a couple sketches the beautiful views and people around. 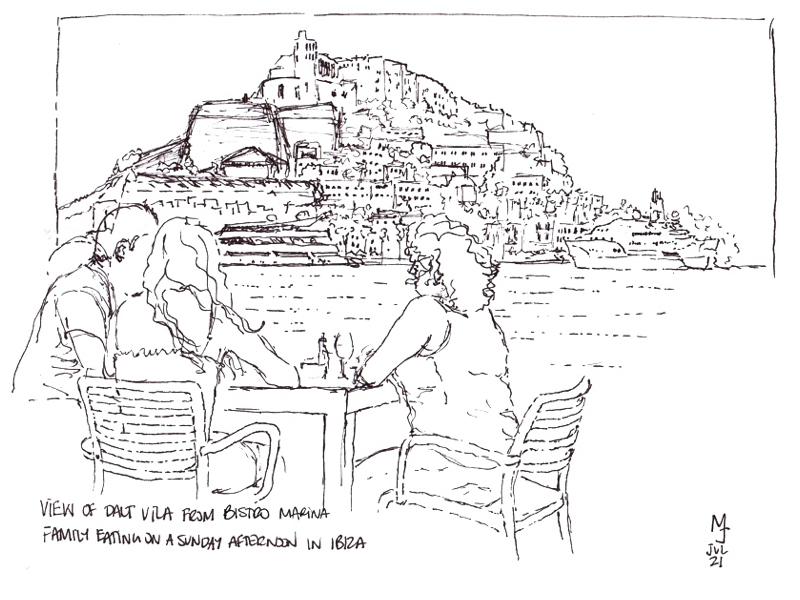 I drew a family having lunch overlooking Dalt Vila. It's one of the highlights of my trip because the women on the right came to check it out once they were done eating and asked if she could show it to her family and if they could take a picture. Of course that was not a problem. She loved it. She kept saying how nice it was and that she was going to frame it and put it on their wall. That made my day. I realized that I had just captured a beautiful moment in this little family's life and left them a memento. We ate really good food while in Ibiza. 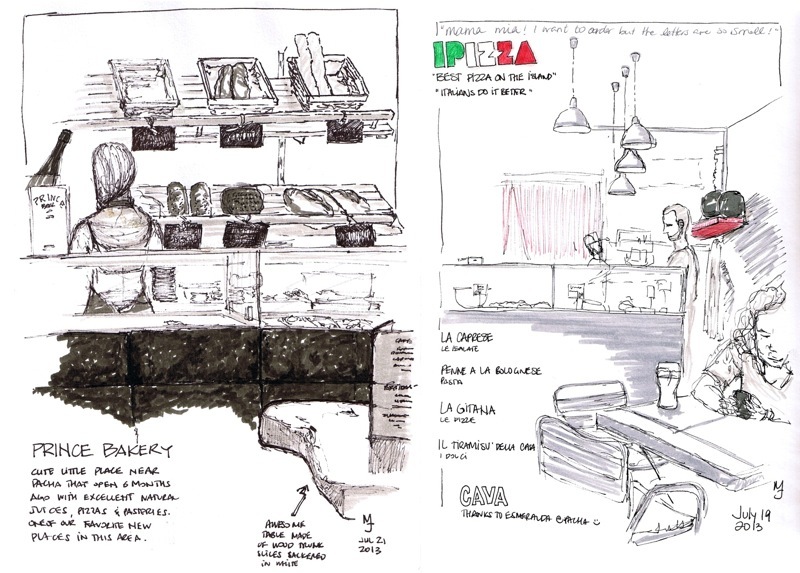 We also discovered a couple great new little places in the area : A bakery called Prince, a pizza joint called Ipizza and an organic restaurant called Yatiri. 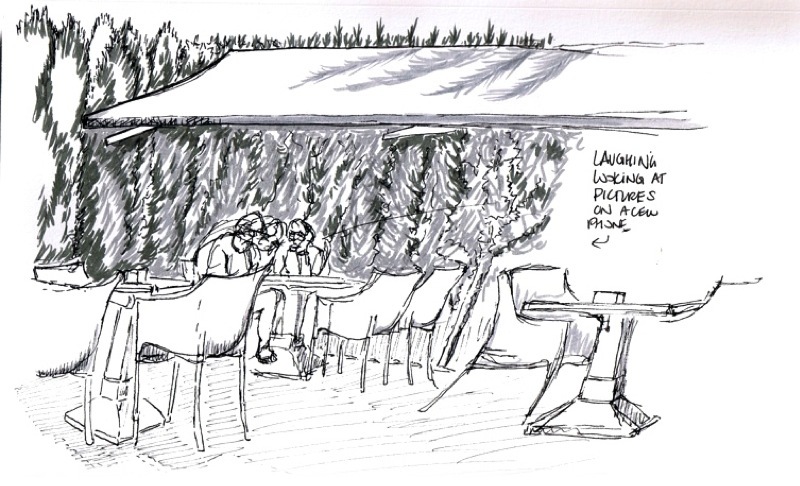 We went to these places a couple of times and I did a bit of sketching on two occasions as well. I highly recommend these places if you get a chance to visit this part of the island.